This morning at the Central Bank of Kenya, President Uhuru Kenyatta launched a new generation of coins in Kenya. This follows the 2010 constitution which barred the image of any person, (Notes and coins issued by the Central Bank of Kenya may bear images that depict or symbolise Kenya or an aspect of Kenya but shall not bear the portrait of any individual) appearing on Kenya’s currency, a practice that has happened since independence, primarily with images of the first and second presidents’, Jomo Kenyatta and Daniel arap Moi. The main theme of the coins, which the President said is “Kenya reborn and prosperity” follows the conclusion in October, of a series of long-running cases that had held up the procurement and printing of new currency by De La Rue. The President said that the new currency has features that make them accessible to visually impaired people. This entry was posted in CBK, De la Rue on December 11, 2018 by bankelele. Monday saw the conclusion of the receivership of Chase Bank as SBM Kenya, part of a Mauritius financial group, completed a carve out of assets, staff and branches of Chase Bank that was overseen by the Central Bank of Kenya and the Kenya Deposit Insurance Corporation. CBK Governor Patrick Njoroge said this was a historic event in Africa, not just in Kenya, as previously when banks were shut down, they stayed closed – but that since Chase closed and was reopened in April 2016, 97% of its depositors had been paid in full, and the remaining (large) depositors could now get structured access to 75% of their deposits through SBM (including 50% of their deposits immediately) over a three-year period during which they will earn interest. He said this had been accomplished as a private sector-led initiative, supported by KCB, and that the process had been transparent throughout, with a unique EOI (expression of interest), done to maximise value for depositors and stakeholders. He added the remaining 25% of the assets would remain with Chase Bank (in receivership) and that CBK and KDIC would continue working to pursue the full recovery of the assets that were illegally taken from Chase Bank. Kee Chong Li Kwong Wing, Chairman of SBM Holdings, said that they would work with local staff and management of the bank, first to get it back to $1.5 billion assets it was before the closure and then to double in size in 3 to 5 years. He said the vision was for SBM Bank Kenya to have its own local investors, board and management and eventually be listed on the Nairobi Securities Exchange. He added that the model of managing overseas subsidiaries by remote control had not worked in Mozambique and Zimbabwe and that they would not repeat that in Kenya which had potential to be a key partner with Mauritius. SBM Kenya now moves from being a Tier III to Tier II bank as SBM will also invest an additional $60 million (Ksh 6 billion) for the bank’s growth, taking its investments in Kenya to $86 million. The bank has taken on and rebranded 50 of 62 previous Chase branches and absorbed 825 staff into SBM Kenya. 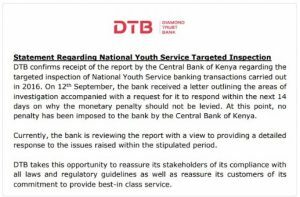 This entry was posted in bank service, CBK, Chase Bank, receiverships, SBM on August 23, 2018 by bankelele.